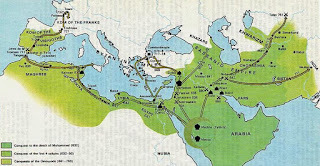 The Umayyad Caliphate was the second established after the death of Muhammad. After the first Muslim civil war (661 AD) Syria became its power base with Damascus its capital. Readers wishing to dig deeper into the political structure and organisation of its army, I recommend Armies of the Caliphate by Hugh Kennedy. The Umayyad Caliphate is best known for extending Islam to as far east as India (Sind) and to the Spanish peninsula in the west. 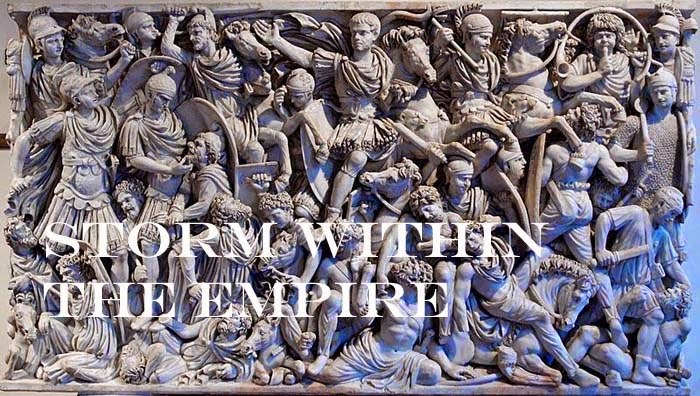 The rapid expansion of its frontiers was frequently punctuated by rebellion within the empire; internal strife that rose from old tribal rivalries and economic recession. After a rule of nearly nine decades, the Umayyad are supplanted by the Abbasid in Syria, while other regions made use of the opportunity to become independent, such as the Umayyad in Spain and Sind. 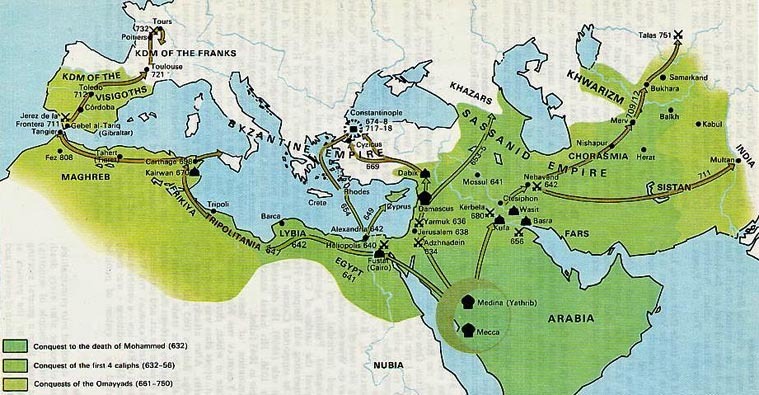 Map: From the Islamic History blog/Umayyad Caliphate. The figures are Old Glory 15’s. Infantry are painted in the standard ‘white’ that is recorded for Umayyad troops while the mounted are now heavily armoured, leaving little to see of clothing colour. A second command was collected and painted so the civil wars could be played. 1 x General (Cv), 3 x jund cavalry (Cv), 3 x spearmen (Sp), 3 x archers (3Bw or Ps), 1 x Asawira (Cv) or Bedouin (LH or LCm), 1 x Ghazis or Turkish horse archer (LH) or Dailami (4Ax) or Syrian hillmen (3Ax or Ps).